Note: I am off work today and I think I am heading up to ski Wimpy’s. It looks like we only got a trace of new snow last night, but it is supposed to snow all day. Hopefully the wind will help and fill in the tracks before we get to the top. This TR is from December 18, 2005. The Southwest Couloir of Teewinot comes off the high plateau west of the summit and faces southeast. Approach via Glacier Gulch, continue up the moraine, then up and right to the beginning of a series couloirs. Some of them go, some of them don’t. The climbing never gets too hard if you choose the wrong one though, so don’t fret. Dustin Lemke was my partner today. He has sort-of become a substitute for Reed Finlay, my typical ski partner. Dustin is in good physical shape and is beginning to fine-tune his steep skiing technique. 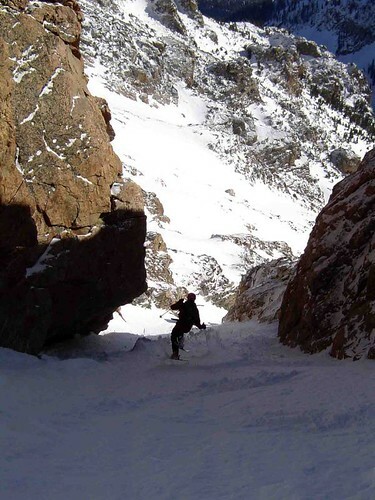 A little scary at times, but getting better every couloir non-the-less. I think he’s psyched to be tagging along these days and I can always use good, reliable ski partners – that can also deal with me. We approach with the usual rest stops and decisions as to the best way up to Delta Lake. When filled in and safe, I think directly up the drainage is the quickest. The boot packing goes well and the snow seems just about right. The couloir looks in great shape and I can’t wait to rip it up. 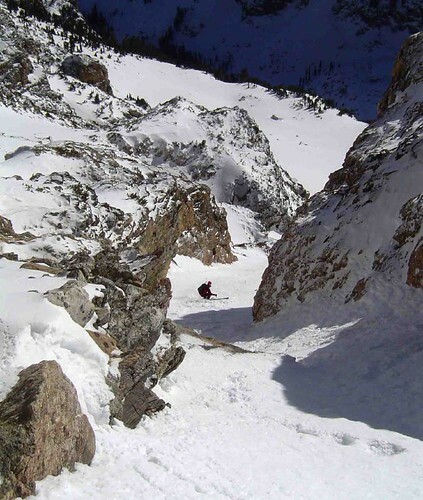 I skied this line years ago – maybe 1998(ish) and remember it being really fun. The weather has stayed very nice today and we were able to ski it smoothly and in style with big grins on our faces. The couloirs connect by ramps and slots and it is fun picking our way down the mountain. The views aren’t too bad either. We eventually reach the apron after about 1500-2000′ and find more great skiing down to the Teton Glacier. Surprisingly, the snow remains soft to Delta Lake on the often wind-packed moraine. We decided to head skiers right and hook up with Burnt Wagon Gulch after skiing a few hundred feet down from the lake. A lot of deadfall to negotiate on the way there, but I think the best choice down to the valley considering the conditions. I love these mellow days in the high peaks. When the weather is calm, the sun is warm, and the slope is steep, but not too steep. Having skied lines before also makes you feel more laid back when you ski them for a second or third and four times. God I love to ski! Damn, Romeo: Do you ever tire? We should all follow your example of getting after it every-single-day!